The Charles and Sophie Hofman house is a large two-story structure of Eastlake styling surrounded by yard and driveway. The building is a good example of a late Victorian house. The archaic fabric of building is nearly intact with little compromise of architectural integrity. There is an excellence of craftsmanship throughout the building. Early Ukiah was reminiscent of a New England village. The predominate building style was vernacular with a Greek Revival flair. Decorative elements were simple. Houses were plain. Even the downtown commercial core carried a vernacular theme. Most buildings were plain wood structures. The few brick buildings were severe and unadorned. The only two exceptions were the handsome Italianate style IOOF Hall and the County Courthouse, a curious and fascinating mixture of Victorian eclectic and Roman Temple. The coming of the railroad in the spring of 1889 changed the look of the local Victorian houses. For the first time decorative trims and fancy work were available from the San Francisco mills at affordable freight charges. 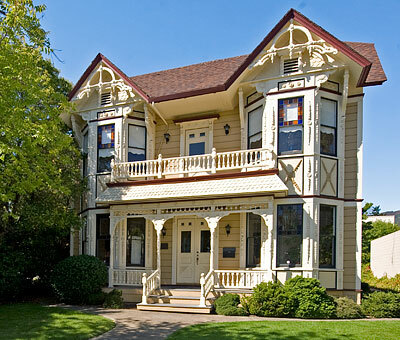 Large, fanciful mansions were built from Eureka to San Francisco. The Hofmans were in the top layer of the local economic strata and were proud of their achievements, socially, religiously and financially. Their house cost $4,000, the second largest sum spent in Ukiah at the time. Excerpted from the NRHP Nomination.